Dam man thats awesome! Keep it up. Nice list of companies paying ya as well. Great stuff YD. You're looking at 2 months out of every quarter churning out over $1k of dividends. That's awesome! I'm still looking for that elusive 1st month but I'm thinking June will finally bring that about. All the best in 2018. Awesome total for the month and that chart keeps pointing in the right direction. Keep it up and have a good 2018! Can we start calling you mature div - these numbers are awesome. Almost the $1k mark - hoping your January figures pull through. Congrats on closing the 2017 year on a strong note sir. 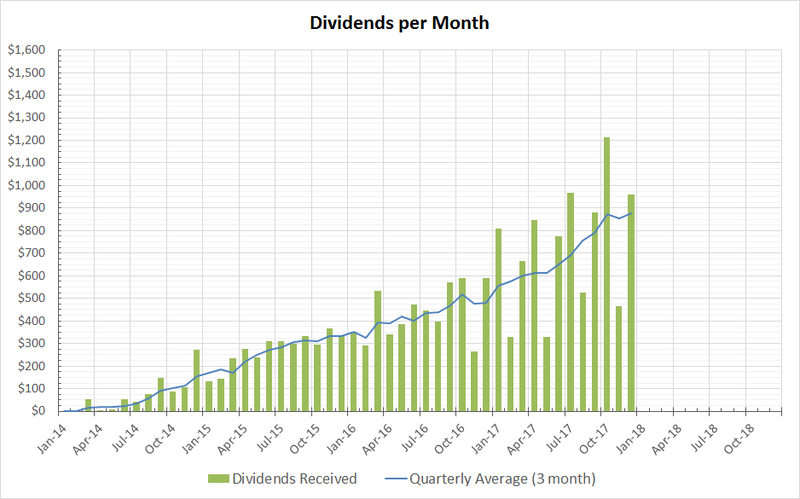 Congratulations, Young Dividend -- keep up the great work and soon you'll collect more than $1,000 every month! I had a record month in December (only by 51¢), but I'll take it! Take care and happy investing in 2018! Fantastic work mate, keep up the good work!